For the American football variant, see Six-man football. For other versions of association football played indoors, see Futsal and Five-a-side football. Indoor soccer or arena soccer (known internationally as indoor football, minifootball, fast football, floorball or showball) is a game derived from association football adapted for play in a walled indoor arena. Indoor soccer, as it is most often known in the United States and Canada, was originally developed in these two countries as a way to play football during the winter months, when snow would make outdoor play difficult. In those countries, areas such as hockey rinks or basketball courts are adapted for indoor soccer play. In other countries the game is played in either indoor or outdoor arenas surrounded by walls, and is referred to by different names (such as fast football (futbol rapido) in Mexico, showbol in South America, and indoor football (futbol indoor) in Spain). Indoor soccer has different regulations from other versions of association football designed for indoor play, such as futsal and five-a-side football. Unlike futsal, which is played on ceramic surfaces, indoor soccer is played on synthetic turf. Indoor soccer courts are delimited by walls instead of lines, and there are no player throw-ins. FIFA, the international body that oversees international association football competitions, does not sanction the synthetic turf version of indoor soccer, having developed its own code of indoor football (which they refer to as futsal). Indoor soccer is most popular in the United States, Canada, and Mexico, with several amateur, collegiate and professional leagues functioning. While internationally less popular than futsal, indoor soccer is also played at the league level in many countries outside North America. The World Minifootball Federation (WMF) is the governing body of indoor soccer at the international level, having replaced the International Fast Football Federation (FIFRA). The term minifootball, which was originally coined in Europe, has been adopted by the WMF as a standard international name for the sport. Indoor soccer is played throughout the world. Currently, the international federation dedicated to promoting the sport is the World Minifootball Federation (WMF) based in the Czech Republic. The WMF replaced the International Fast Football Federation (FIFRA), which had been based in Mexico and later, the United States. There are also regional federations who govern the sport including: African Minifootball Federation (AMF), Asian Minifootball Confederation (AMC), Confederacion Panamericana de Minifutbol (CPM), European Minifootball Federation (EMF), Oceania Minifootball Federation (OMF). During its existence, FIFRA organized several indoor soccer tournaments for national teams, including the Indoor Soccer World Championship. The only edition of this tournament took place in Mexico in 1997, with the host team winning the title. No other indoor soccer world championship was held until 2015, when the WMF organized the first WMF World Cup in the United States. The first edition of the relaunched tournament was won by the USA. Indoor soccer is a common sport in the United States and especially Canada, with both amateur and professional leagues. Due to the short season for outdoor soccer in Canada and the Northern United States, and the ubiquity of arenas built for ice hockey and basketball which can easily be converted to indoor soccer (similar reasons as to why indoor lacrosse is more popular in Canada, field lacrosse in the United States). It is especially popular in Northern Canada due to the often unplayable outdoor conditions and its appearance in the Arctic Winter Games. Indoor soccer or futbol rapido has also become a popular sport in Mexico, being included as part of the Universiada (University National Games) and the CONADEIP (Private School Tournament), in which university school teams from all over Mexico compete. In Mexico, "indoor" soccer fields are frequently built outdoors (though indoor courts are also used in some tournaments). Indoor soccer is known in Brazil as showbol, with several current regional leagues. Formal national leagues have also formed in Bolivia, Colombia, Uruguay, Ecuador and Peru. However, the most common variation of indoor soccer played in Brazil is Futsal. Indoor soccer is also played in several European countries. In the United Kingdom, Masters Football is the most well-known competition. Tournaments among Masters teams (consisting of veteran former players from professional 11-a-side teams from each country) are regularly played. In Spain, some over-30 ex-professionals represent their clubs in the Liga Fertiberia which plays a five-a-side variant. There is a European indoor soccer federation known as the European Minifootball Federation (EMF). EMF organize the European Minifootball Championship (miniEURO) every year and in recent years countries have established official national minifootball associations to help them further organize and develop it. EMF organize variations of six-a-side football and this could come in different shapes and sizes from a large custom-built facility with multiple pitches or even an 11-a-side pitch temporarily split into smaller pitches. This is not to be confused with the term used in Russia and some other former Soviet countries, where the term mini-football is used to describe futsal. The Field. Most indoor soccer arenas are rectangular or oblong in shape, with artificial turf floors. In many collegiate intramural leagues, the game may be played on basketball courts, in which case the floor is hardwood. Walls (often the hockey dasher boards and plexiglas used for that sport) bound the arena. Field sizes are generally smaller than soccer fields, and the goals are recessed into the walls. Goals are also smaller than in standard soccer and the penalty area is also smaller. The field is commonly 200' by 85' (approx 61m by 26m), the regulation size for a hockey rink in North America. Duration. Most indoor soccer games are divided into four quarters of 15 minutes each, for a total of 60 minutes of play time. There are two 3-minute periods between the first and second, third and fourth quarters and one 15-minute half-time between the second and third quarters. If the game stays tied until the time runs out, there will be extra 15-minute, golden goal overtime periods. However, amateur leagues generally consist of two 25-minute halves with no overtime for tied games. The team. Most indoor soccer games are played with six active players per team including goalkeeper and either defense or forward also known as attackers and strikers. Substitute players are permitted. Play off of walls. The ball may be struck in such a way that it contacts one or more walls without penalty or stoppage. If the ball flies over the walls or contacts the ceiling, play is stopped and the team opposing the one that most recently touched the ball is awarded a free kick at the location where the ball left the arena or made contact with the ceiling. Contact rules. Standard contact rules generally apply (i.e. ball contact must be made during a play on the ball, no charging with hands or elbows, no charging from behind, no holding the opponent etc.). Many leagues ban the use of the sliding tackle, though such techniques are less useful on artificial turf or wood than they are on a slick natural turf field. If one attempts to slide on an indoor field, painful burns and/or cuts can occur. No offside. Most leagues play without an offside rule. Some leagues enforce a "three-line violation", prohibiting players from playing the ball in the air from behind the front line of their own penalty area across all three lines into the opponent's penalty area. Violations often result in a free kick for the opposing team at the front line of the offending team's penalty area. Substitution. Most leagues allow unlimited substitutions while the ball is out of play. Some allow live substitution while the game is in progress, provided that one player leaves the arena before another steps on. A minority of leagues require substitution in shifts. Cards. In addition to the traditional yellow and red cards of association football, some leagues include a card of a third color (blue is a common color) or another form of warning before the issuance of a yellow card. Often, leagues with a third card include a penalty box rule, and issuance of this third card requires the penalized player to sit in the box for a prescribed period of time (usually two minutes as in ice hockey) during which his or her team plays shorthanded. In leagues using the traditional card system, it is common for the yellow card to carry with it a penalty box rule. Zones. Because of short fields and walls surrounding the goal, a common tactic is to attempt to score at kickoff by shooting at the goal and charging at the goal with all five non-goalkeeper players who overwhelm the other team's defense and score at close range. As this depletes the tactics and drama of the game, many leagues have adopted an ice hockey-like zone rule, requiring that the ball not cross more than a certain forward distance toward the goal without being touched by a player. The ball. For leagues that play on hardwood, the ball is generally covered with suede or a similar non-marking covering. The harder surface generally makes the ball "bouncier" and more difficult to control, which in turn tends to make scoring goals more complicated. The crease. 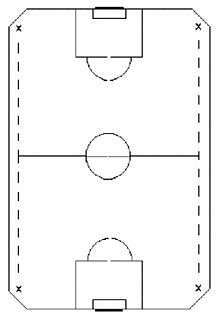 Some leagues enforce a special zone inside the goalkeeper's box called the crease. No player may shoot the ball from inside the crease unless that player entered the crease already having the ball. Multi-point scoring. Some leagues value goals scored from a greater distance to be worth two or three points from behind an arc, similar to basketball's three-point field goal. Sometimes, leagues with a multi-point system also use a rule that a minor technical infraction gives the non-offending team a one-on-one opportunity to score on the opposing goalkeeper, worth one point. Many indoor coed leagues will give a female player two points for scoring a single goal. Sixth attacker. Some leagues allow a team which is trailing by one or two goals late in the final period to replace the goalkeeper with a sixth position player to increase its offense in an attempt to tie the match, exactly as is done in ice hockey under those conditions. ↑ "PASL Commissioner Kevin Milliken Talks Ontario Fury Debut, First World Cup". PASL. 12 November 2013. ↑ "Gamesheet: Mexico vs USA". WMF World Cup. 29 March 2015. ↑ "USA Win Inaugural WMF World Cup". Indoor Soccer News. 29 March 2015. ↑ "EMF - European Minifootball Federation". eurominifootball.com. Retrieved 30 July 2012. ↑ Quarstad, Brian. "USL Announces Merger with Major Indoor Soccer League". insidemnsoccer.com. Retrieved 30 July 2012.